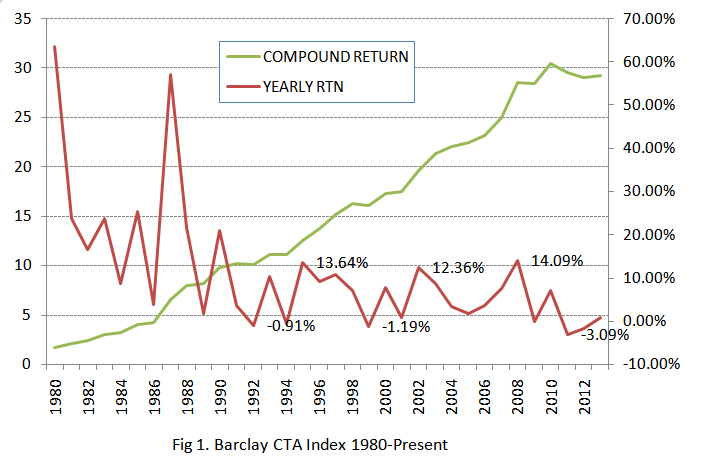 Is CTA trend following Dead? This is just a very short comment related to discussions I've been having with a friend about trend following funds and a lot of the recent blogs and debates proclaiming the death of trend following. 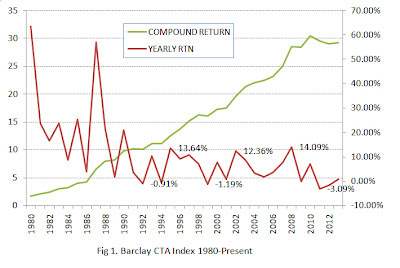 Using the Barclay CTA Index as a proxy, we can certainly see that there was a huge level shift of performance from around the 1990s and onwards, making the annual return appear to be on an almost exponential decay. However from about 1990 to present, the annual returns have have been steadily oscillating in a range band from around -1% to 13% (with some outliers), and although the return per decade has been dropping over the last few decades, there's not really enough data to make any strong judgements about it's demise. Just looking at the oscillatory behavior and considering the bearishness towards this class of funds-- It might just suggest a good reversion based long bet on trend-followers. Labels: Is CTA trend following Dead?